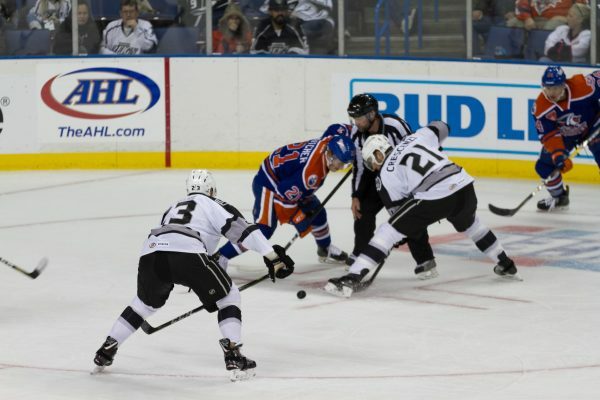 After seven years in the East Coast Hockey League, the Reign opened their third AHL campaign — marking their 10th season of professional hockey in Ontario — against a familiar for in the Bakersfield Condors. Both teams were part of a five team contingent who brought hockey’s premier minor league action to the west coast a few years ago. They also skated against each other for multiple seasons of ECHL action prior to the step up. Friday night, both clubs were looking to shake off slow starts to the 2017-18 AHL season, with Bakersfield grabbing one win in three prior contests and Ontario winless in three of their own. The Reign were afforded the first powerplay chance of the evening, creating some chances along the way. They attempted to work the puck down low to Michael Mersch, who then tried a stuff move utilizing his stature. However, the powerplay and nearly twice the amount of shots couldn’t keep Bakersfield from netting the first goal of the contest. Condors forward Chad Butcher beat Reign goalie Jack Campbell from a tough angle next to the net, along the goal line. The Reign netted 17 shots but couldn’t beat Condors netminder Nick Ellis during the first frame. Bakersfield would take the first period 1-0. Ontario opened the second period as a team on a mission, dictating play and creating high-level scoring chances through the first quarter of the frame. The flurry of action in front of the Bakersfield net caused Whittier, CA native Mitch Callahan to trip Phillipe Maillet. The ensuing powerplay would prove non consequential as Condors defenders battened down the hatches while a man down. The teams swapped possession and ends of the ice until Joe Gambardella pushed a loose puck passed Paul LaDue and beat Campbell on a virtual breakaway. The UMass-Lowell product’s goal would suppress the Ontario effort for the remainder of the stanza and Bakersfield skated off with a 2-0 lead. The third began with end to end action as Campbell made a nice stop to bail his team out of a turnover. The save led to Jonny Brodzinski’s and likely Ontario’s best chance of the night, but was turned away by Ellis to protect the lead. For the third period in a row the Reign would get a mid period man advantage. This one, like the first two, was uneventful and Ontario could not find the back of the net. The Reign sputtered to a hault as the final period wore on. Bakersfield took the win with a final score of 2-0. The action continues Saturday as the Condors visit the Reign at CBBA one more time before heading back north. Ontario will look to grab their first win of the season in what can be considered the slowest start since their vault to the AHL from the East Coast Hockey League. Having been shut out for the second time in four games, Ontario will look to bounce back against Bakersfield at 6:00 PM Saturday night. Head Coach Mike Stothers spoke to the media following the game about Jonny Brodzinski, Justin Auger and more. On Jonny Brodzinski getting back to LA: It’s kind of nice to have Brodz there. He needs to feel comfortable on the ice. Sometimes guys get overwhelmed when they’re playing in the NHL with a Kopitar or a Carter. it’s not easy. You want to be perfect and make all the plays and you stop playing the way you need to. It’s just a matter of getting used to it. On Justin Auger: I Expect him to stay up there. I don’t expect him to come back. I thought he did very well in his first game the other night against Montreal and now he’s going on the Eastern road trip with them. Good for Augs, he’s come a long way. He’s a big body that can move, he’s elusive for a big guy, he’s got nice hands. He’s put in the time and the work, over 200 AHL games, so he deserves it. Very happy for him. On Matt Luff: He’s a guy that has showed some scoring prowess in junior and in the exhibitions games, so we’re looking for Luffer to score. But, I mean there’re lots of guys we’re looking at, Luffer’s one of them. He’s got a good hockey sense, good hands and he’s good in around the net. I think it’s only a matter of time before he starts filling the net. On the challenge of climbing the division: Well looking up is not as good as looking down, but it’s all in how you perceive it. IT’s not as big of a mountain as you make it out to be. We knew there were going to be some growing pains with this group. We’re going to weather the storm, get through it and throughout the season there will be times when you struggle to score. Maybe we’re going through it early and we will put it in our rearview mirrors and we won’t have to deal with it again.